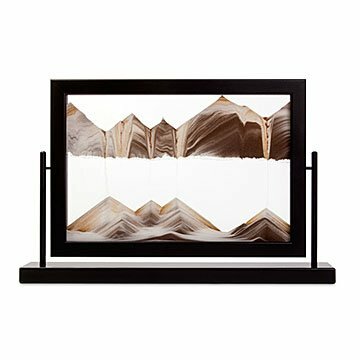 Designed to be a statement piece, this stunning sand art is mammoth in form and mesmerising in function. Forming dynamic dunes as the sands shift, this ever-changing work of art makes a lasting impression. Designed to be a statement piece in the home or office, it's eye-catching in form and mesmerising in function. Austrian artist Klaus Bösch, also known as the "sandman," invites others to participate in his process by flipping the design to create their own sandscapes at a whim. With every turn, new vistas emerge as the light and dark sand trickle together into deserts, mountains, clouds, rain, oceans, and smoke, all ebbing and flowing into one another. Handmade in Austria. Wipe clean with a soft cloth and glass cleaner.